Thanks for information. Here below is a little bit of follow-up. be available for use by early 2019? of migraine days were 23% per month. had 1.6 days reduction in medication days. versus baseline in the placebo group. Kerrie are you okay? It has been 5 months since your last post. Hopefully you’re just busy and doing well. Hi Becky, thanks for the concern! I’m actually doing really well, but brain fog has kept me from writing. The brain fog seems to have been a drug side effect and is diminishing now that I’ve gone off the drug. I think I’ll be able to write a post this week. I participated in one of Amgen’s Phase III studies for “episodic” migraines. My relief was nearly 100%!! 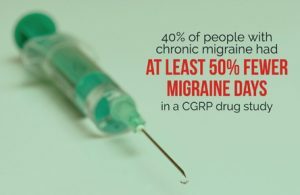 I Having been migraine-free for many months, it will be difficult to go back to suffering again if this drug is not submitted to the FDA for approval quickly, (2) approved quickly by the FDA, and (3) made available quickly to migraine patients. This drug has been life changing for me. Good luck to all my fellow migraine sufferers. So good to hear of your results!! !